Condensation dehumidifier work on the principle of condensation of moisture from the surrounding air. Air is taken into the dehumidifier through the inlet of the machine. The same is condensed inside the machine utilizing a compressor. The moisture content of the air is converted into water and dry air is pumped out. The machine produces water which will be drained out automatically. These types also are known as compressor type dehumidifiers, refrigerant dehumidifiers or simply compressor dehumidifiers, since they are operating through a compressor. The lowest capacity model in this portable series of condensation dehumidifier (compressor dehumidifier) is 32 liter per 24 hours and the highest capacity model is 300 liter per 24 hours. 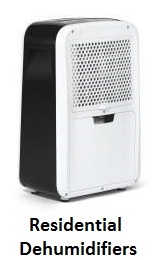 This model is the smallest in this series of compressor dehumidifier. Dehumidification performance is 32 litres per 24 hours. Operating range temperature is from 5°to 32°C and humidity from 32% to 100 % RH. Air flow rate is 300 m³ per hour. The weight of this dehumidifier is 24 kg. 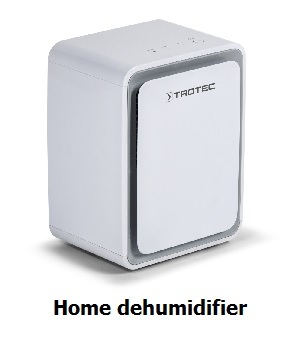 The dimension of this dehumidifier is 375 mm (L) x 375mm (W) x 603mm (H). Electrical consumption is 0.56 kW. This is industrial condensation dehumidifier type (also called industrial dryer) of TTK Pro series. Dehumidification performance is 150 liters per 24 hours. Operating range temperature is from 5° to 32°C and humidity from 32% to 100 % RH. Air flow rate is 950 m³ per hour. Dimension of TTK 800 is 585 mm (L) x 630 mm (W) x 1020 mm (H). Electrical consumption of TTK 800 refrigerant dehumidifier is 2.4 kW. Compressor type is Rotary piston compressor. Type of cooling agent (refrigerant) is R-407C. Sound level at 1 meter from the machine is 63 dB. An optional water pump is available for all the models for pumping water to longer distance if required. Air flow rate is 1500 m³ per hour. The weight of TTK 655S is 70 kg. Dimension of TTK 655S is 585 mm (L) x 630 mm (W) x 1020 mm (H). Electrical consumption is 2.4 kW. Sound level at 1-meter from the machine is 63 dB. 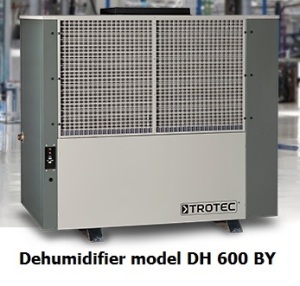 These models are also known as refrigerant dehumidifiers. There is a cooling agent which perform the cooling action. A cooling agent is generally known as a refrigerant. The coils are cooled by this cooling agent which helps in condensation. Refrigerants such as R407C & R-410A are generally used as cooling agents. TTR 55 E with a capacity of 8.7 l/24h, 160 m³/h. TTK 24 E with a capacity of 10 l/24h,100 m³/h. TTK 25 E with a capacity of 12 l/24h, 50 m³/h. TTK 30 S with a capacity of 12 l/24h, 100 m³/h. TTK 31 E with a capacity of 12 l/24h, 120 m³/h. 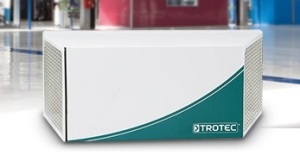 TTK 40 E with a capacity of 14 l/24h, 100 m³/h. TTK 50 E with a capacity of 16 l/24h, 100 m³/h. TTK 70 S with a capacity of 24 l/24h, 150 m³/h. TTK 71 E with a capacity of 24 l/24h, 180 m³/h. 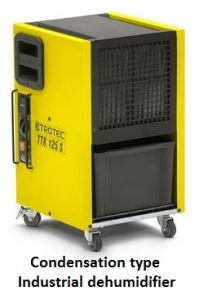 TTK 75 E with a capacity of 20 l/24h, 192 m³/h. TTK 75 S with a capacity of 24 l/24h, 180 m³/h. 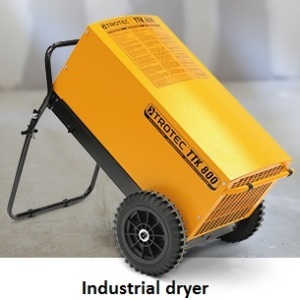 TTK 90 E with a capacity of 30 l/24h, 240 m³/h. TTK 100 E with a capacity of 30 l/24h, 200 m³/h. TTK 100 S with a capacity of 30 l/24h, 200 m³/h. TTK 105 S with a capacity of 30 l/24h, 40 m³/h. TTK 120 S with a capacity of 35 l/24h, 510 m³/h. TTK 120 E with a capacity of 30 l/24h, 340 m³/h. TTK 122 E with a capacity of 40 l/24h, 350 m³/h. TTK 200 with a capacity of 35 l/24h , 230 m³/h. TTK 400 with a capacity of 75 l/24h, 420 m³/h. TTK 800 with a capacity of 150 l/24h , 940 m³/h. TTK 1500 with a capacity of 300 l/24h , 2.200 m³/h. TTK 125 S with a capacity of 32 l/24h, 300 m³/h. TTK 175 S with a capacity of 50 l/24h, 300 m³/h. TTK 355 S with a capacity of 70 l/24h, 1.500 m³/h. 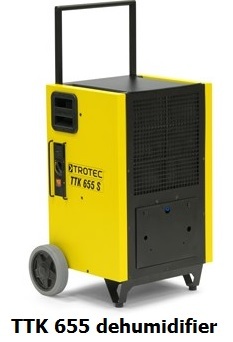 TTK 655 S with a capacity of 150 l/24h, 1.500 m³/h. Vacker Arabia supplies all kinds of condensation dehumidifiers in all cities of Saudi Arabia covering Jeddah, Dammam, Riyadh, Jubail and Khobar.